Crafted from elegant 9ct white and yellow gold, this exquisite diamond ring is inspired by Jasmine, as part of the Enchanted Disney Fine Jewelry collection. A sensationally sparkling ring, featuring no less than 1/5ct worth of delightful diamonds in a cluster formation. 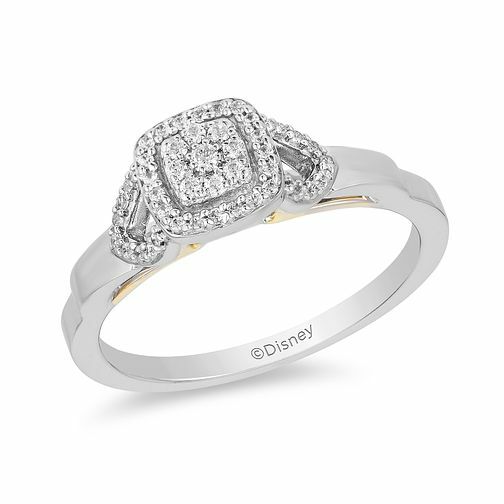 A beautiful ring inspired by Disney, perfect for making your own magical moment. Enchanted Disney Fine Jewelry Two-Tone Diamond Jasmine Ring is rated 5.0 out of 5 by 1. Rated 5 out of 5 by Anonymous from Stunning Not a typically big carat diamond for an engagement but it looks so beautiful on, almost regal.